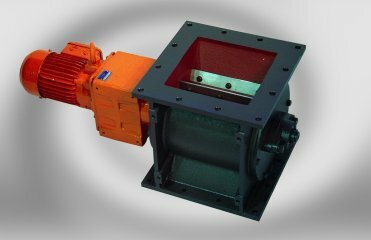 The design includes an impeller which is mounted directly onto the gearbox shaft and an end plate mounted bearing with lip seals on the non-driven side. The inlet ports have “V’s” cast into the side wall to create a scissor cutting action between impeller blade and casing. This ensures smooth rotation without the “chopping effect” experienced with other valves. The result is increased bearing and impeller tip life. The D type valve has a closed end impeller and has adjustable tips fitted as standard. This valve is suitable for applications where the pressure differential is below 30 kPa and the material is non abrasive and free flowing. Various options are available including different materials of construction such as stainless steel, soft flexible or hard wearing impeller tips, body venting, inlet scrapers and hard chromed casings. Standard sizes include: 100, 150, 200, 250 and 300.